Today, our friend Ana is back on the blog to share her delicious, allergy-friendly, Harvest Apple Crisp recipe. We’re also excited to share that Ana is the newest member of The Real Food Dietitian’s team! She is our Virtual Assistant & Recipe Creative specializing in healthy and allergy-friendly wholesome treats & baked goods. Treats you can feel good about eating and sharing with your kids and others. You’ll definitely want to be on the look out for more of Ana’s delicious recipes. Back to Ana…..
With the warm cinnamon and sweet apple smells coming from the oven and the cool crisp breeze coming in the open windows, I know fall has arrived. Fall is a favorite season as the temperatures have cooled here in the Midwest and our homeschool days are back in session. Our homeschool days are full of boisterous boys, lots of nature, and a balance of unschooling and textbooks. Follow along here for a peek into our life. Earlier in the week, we made our way to our grandma’s little apple orchard. The kids love visiting and helping pick apples. Their task is to pick up the apples that have fallen from the tree and sort them into a “keep” and a “toss” pile. They carefully make their way through the fallen apples, throwing the bruised and buggy apples into the tall grass and collecting the good apples in their bags. With our bags full of freshly collected apples and a few in hand for eating right away, we make our way home to start baking with them! Washing, peeling, coring and slicing…I love taking the time to prepare food from nature! Real food may take a little longer to prepare, but it is so worth it. Making homemade meals and desserts with real food has it’s benefits! Healthy foods will create great wellness. My goal as a mom to 4 little boys is to help them grow to be strong, healthy men. Creating healthy foods that are yummy in the eyes of little kids can be challenging. Throw in making it all allergy-friendly, the challenge is heightened! 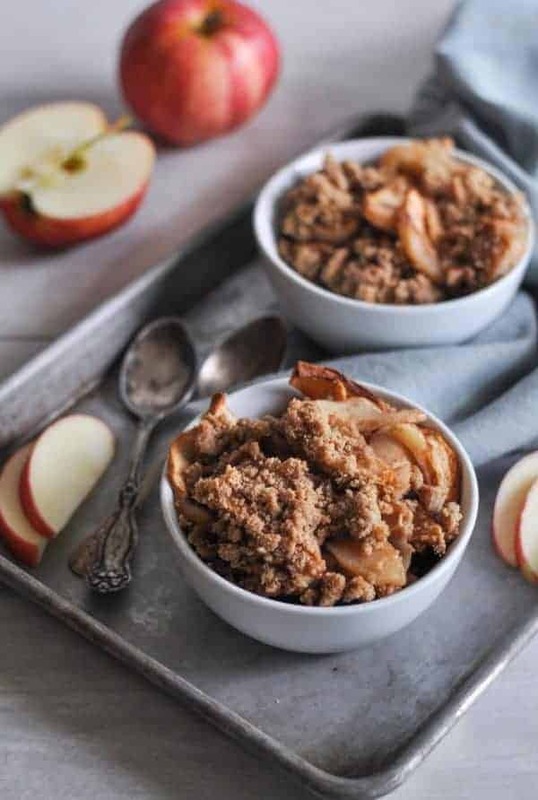 Harvest Apple Crisp is gluten-free, dairy-free & nut-free with minimal sugar added helping me feel comfortable as a mom giving this to my young ones. 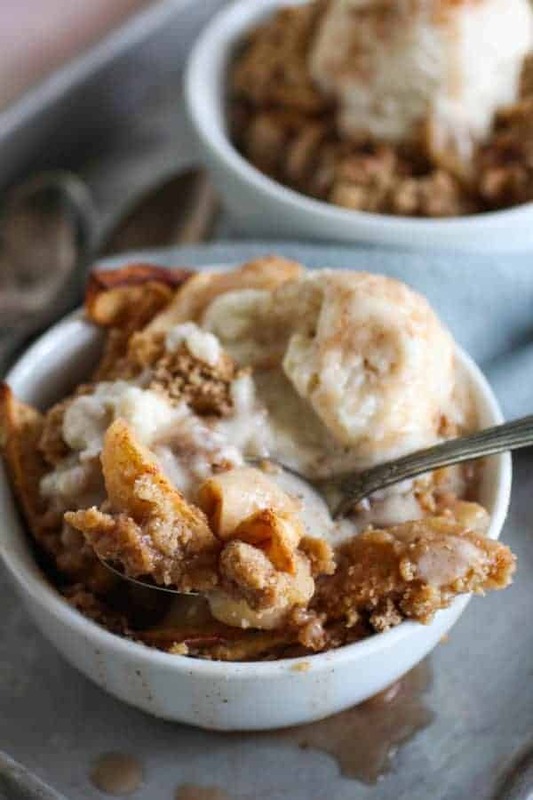 I’m so happy to say that the Harvest Apple Crisp is both delicious and a healthy dessert. The kids will gobble it up almost as quickly as I can make it! For more wellness tips and mom-approved recipes follow along here. 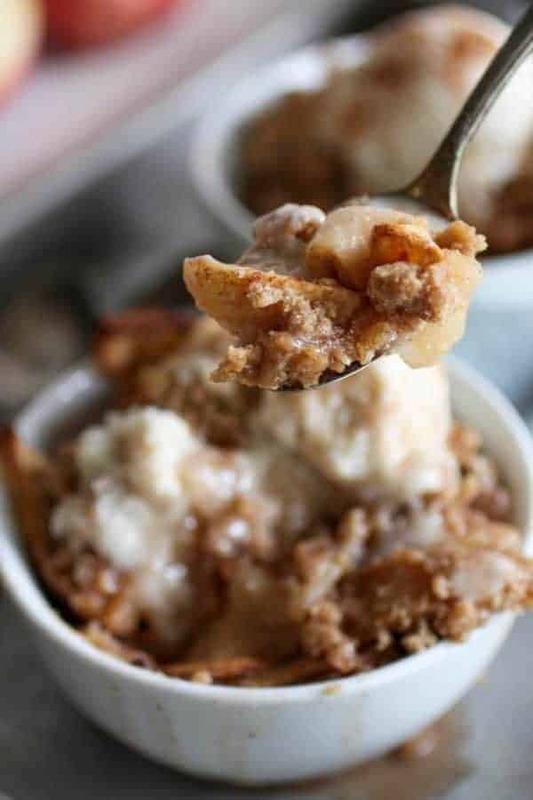 Harvest apple crisp is so delicious! It’s warm with cinnamon, rich with flavor and creamy with coconut milk. A sprinkle of topping that crisps up to the perfect crunch while baking. 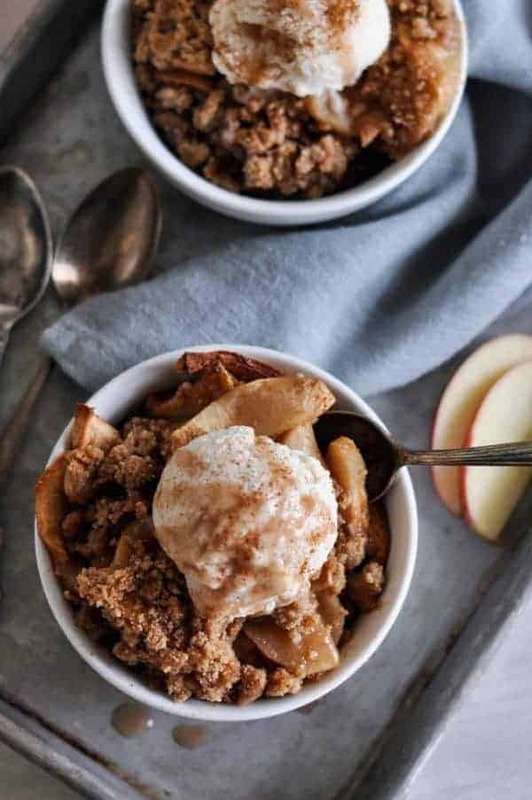 I love baking a big batch of apple crisp when family comes to town, when friends come over to visit, and simply as a creamy and satisfying dessert for my little family. You can even add a scoop of dairy-free ice cream if you wish! 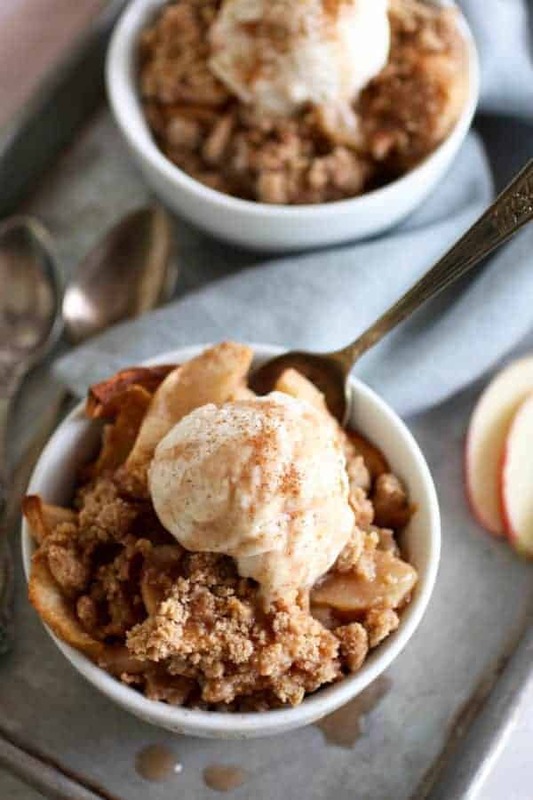 I can’t wait for you to give my Harvest Apple Crisp a try! Learn more from Ana and connect with her on Facebook and Instagram. Warm. Sweet. Rich. Creamy. 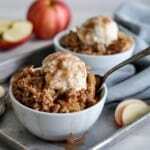 Harvest Apple Crisp is gluten-free, dairy-free & nut-free with minimal sugar added. A delicious & healthy, mom-approved dessert! Feel free to add a scoop of dairy-free ice cream if you wish! In a medium mixing bowl combine sugar, coconut milk and cinnamon. Stir until well combined. Add the sliced apples and stir until all apples are well coated. Pour apple mixture into 9×13 baking dish. In a separate bowl add flour, sugar and cinnamon. Start with 3 Tbsp of coconut oil and using two knives cut the coconut oil into the flour/sugar mixture until a crumble forms. Add additional coconut oil as needed. Sprinkle it over the apple mixture and bake for 35-40 minutes or until golden brown. Let it cool slightly and enjoy right away! Store leftovers in an airtight container in the refrigerator for up to 2-3 days. Right!? We love that you can get exercise and get tasty fruit all at once! Has anyone tried adding gf oats to this recipe? Curious how it would be. Hi Hannah! You could definitely add a 1/2 a cup of oats or so to the crisp. I’d love to hear how it turns out! For those avoiding refined sugars, is something more natural a possible substitute for the brown sugar? Maple syrup or honey, or is coconut sugar considered unrefined? You can substitute coconut sugar 1:1 for the brown sugar (I actually find that I can use slightly less and it’s still sweet enough). Coconut sugar is less refined than other sugars and does have a lower glycemic index. I haven’t tried the recipe with liquid sweeteners like honey or maple but if you do, we’d love to hear how it turned out for you! Can you use reduced apple cider in place of the liquid & reduce sugar? & chopped walnuts! You could certainly try – I can’t imagine that it wouldn’t work. Walnuts would also be a great addition to this recipe. Hi — This looks amazing. Wondering what are the best apples you recommend? I usually go with what I have on hand or whatever organic apples are available in the store. Instead of gf flour could I use brown rice flour? We have not tested this recipe with coconut or almond flour yet though I suspect you could easily replace the gluten-free flour with a scant 1/2 cup almond flour + 1-2 Tbsp. coconut flour with good results. If you try it, we’d love to hear how it turns out. I see 6 cups of sliced apples.. how many apples would this be? That will depend on the size of the apples you use. According to the Betty Crocker website, 3 medium apples (1 pound) will yield 2 – 2 1/2 cups sliced or chopped apples. Going on that, you’d need about 8-9 medium apples (or 3 pounds). About how many apples do you need for this recipe? I don’t want to end up not having enough. 6 medium apples should be good! You may have an extra one to enjoy. Would you be able to add cherries to make this an apple/cherry crisp? If so could you use canned cherries?